I’ve been a fan of Ross Montgomery’s work, ever since he published his debut, Alex, the Dog, and the Unopenable Door in 2013 and I saw him workshop with a group of children at the Southbank Imagine Literature Festival. He asked the children to map an imaginary island – and it looks like he’s done the very same in his latest book. Ten year old Caitlin lives on an isolated island with her parents, shepherded to and from the mainland to school in a boat by her only friend, Frank. When a massive storm floods the beaches with hundreds of dead jellyfish, it also washes ashore a small shrimp-like being covered in strange symbols. Caitlin rescues it, and before long it starts to imitate her and communicate with her. When her mother reacts badly to Caitlin’s new growing friend, the Perijee-named shrimp-like being, now more a beast, grows to an impossible size in self-defence and sends a tsunami across the mainland. 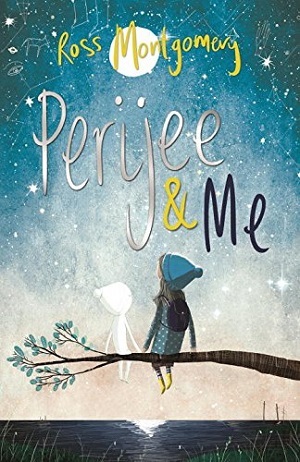 Caitlin realises it is up to her alone to find out what Perijee is looking for and seek to help rather than to destroy him. The reader is guided through the book by a fast plot, but the warmth emanates from Montgomery’s character portrayal of Caitlin. Her lack of self-awareness is made immediately evident, so the reader feels a cordiality towards her from the beginning – she tries so hard and yet fails to understand other people and herself. Her attempts to be friends with old-timer Frank for lack of anyone else, shows her unfailing yet inevitably crushing optimism. Her dyslexia, well described by Montgomery, “the letters flash and change in front of me like traffic lights…like trying to learn an alien language” is key to the plot as well as to her personality – she is an expert at hiding her failings and key emotions – even from herself. Told in the first person, the dialogue with others and the inherent humour allow the reader to see far more than Caitlin does. In fact the massively understated humour, often present in Montgomery’s novels, is what really cements the protagonist in the readers’ affections. The more ridiculous the plot, the more the truisms within shine out. Caitlin is lonely, and largely misunderstood – socially and academically adrift – and Ross paints her with pathos and feeling. The overlying theme is that of friendship – being loyal, having a friend, and feeling happy for your fellow humans (or beasts/aliens). Quirky, weird and wonderful, Montgomery’s novels are always full of impossible, unrealistic, plain ridiculous plot-lines that win over the reader by their simple magic, and the exaggerated ease with which Montgomery skims over any holes. The action is in full-thrust from the minute Caitlin finds Perijee and rehydrates him in a bucket filled with frogs. From a tiny island, the whole world is threatened – and Caitlin moves the reader quickly from city to country, from boat to plane in pursuit of safety and friendship. There were so many external references within the book, but all reminiscent of the tradition of great storytelling. Of course with an alien-like being, thoughts of Speilberg’s ET inevitably surface, but Montgomery plays on this from the start as Perijee grows fingers, glows when happy, and has an obsession with returning home. The conundrum of size and the general public’s fear of the unknown brought back thoughts of The Iron Man and his great nemesis, the Space-Bat-Angel-Dragon, because in Perijee and Me, the monster at the end is feared by all, mainly because of its size. It takes a small child to calm the nation and restore peace rather than ongoing warmongering. And lastly there’s a delightfully wicked ‘grandmother/mother’ type-figure – the head of a cult, who remains broadly reminiscent of the evil women in large narratives, from Pullman’s Mrs Coulther, to the mother in Disney’s Rapunzel, to the Grand High Witch in Roald Dahl’s The Witches. Whether a young reader picks up on all the references contained within or not, one thing is for sure: they will have as much fun reading this book as Montgomery clearly did in writing it. A little treasure – even the cover sparkles. Age 9+ years.